A pair of Swarovski 15x56 SLCs are my long-term astronomy binos. I’ve owned them for a few years, but they have rarely left the garden and never been wet. Imagine my surprise, then, to find that a few spots had developed on the internal lenses. I wasn’t sure if these were re-condensed oil or fungal spots; in either case they shouldn’t have been there. So I decided to test out Swarovski’s return process and report back on how I fared. Note that I didn’t purchase the binos new and had never registered them. They didn’t ask for a receipt either, so the warranty would appear to be fully transferable with no quibbles – nice! 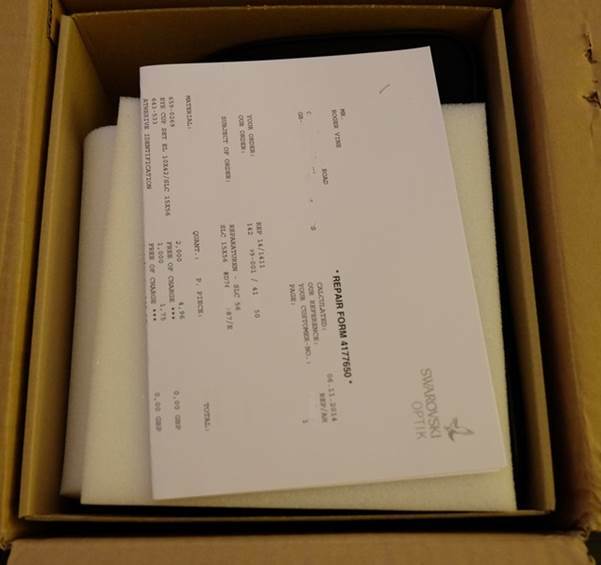 The next day (the 13th Oct) I received a very courteous reply from Sara at Swarovski in Austria, asking me to fill in a return form and send it to their UK subsidiary, along with the SLCs. 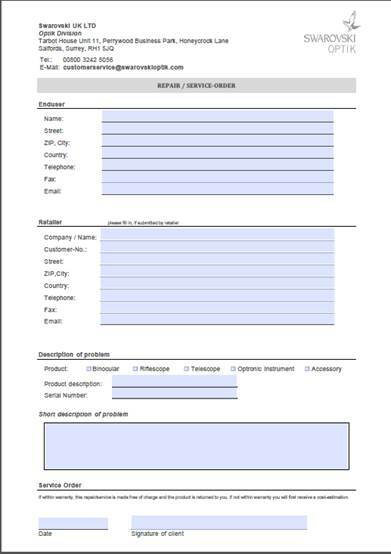 An image of the form is shown below. I duly printed the form, filled it in and sent it with the binos to the UK address at the top. 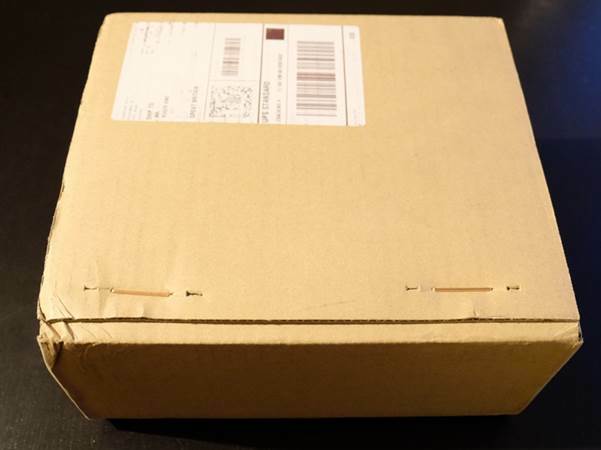 I sent them via Special Delivery, which turned out to be the only cost (£10-15). A few days later, I received a card through the mail acknowledging receipt of the binos. You can see an image of it at the top of this article; interestingly they dated it from my initial contact email. After receiving the card, I called Swarovski UK and they explained that further contact would be direct from Austria. They also explained that Swarovski Austria would only contact me if I was going to have to pay for repair; if the repairs were free I would just receive the binoculars back in due course. Almost a month to the day after my initial contact, the 15x56 SLCs arrived back from repair at Swarovski. The binoculars came carefully double boxed, but the boxes were plain brown, so don’t expect a replacement for your green/white display carton if you lost it. Free UPS shipping direct from Swarovski Austria: carefully packed and double boxed. · The body and armour were replaced, along with the eyecups. · The tripod mount lug was replaced, even though only very slightly worn. · Though they cleaned the optics, they were not replaced or re-coated as far as I can tell. · I omitted the straps and caps when sending them and I didn’t get any back. · The binoculars work perfectly, the problem was fixed and they seem essentially as new. 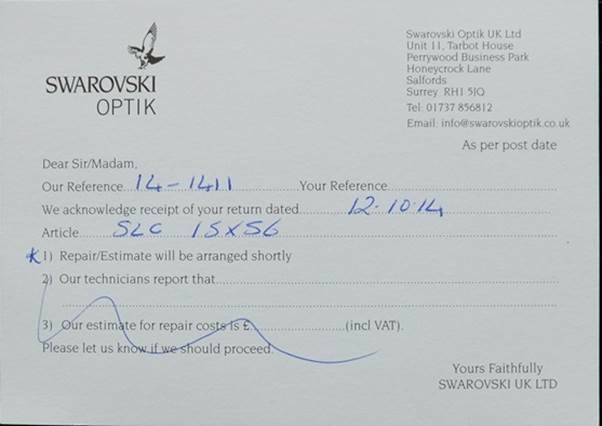 Swarovski provided a detailed, costed invoice of the repairs carried out, even though they were free of charge! Swarovski’s famed warranty has contracted a bit in recent years, with just ten years parts and five years’ parts and labour on offer now (I suspect heavy users were viewing the warranty as a kind of ‘unlimited refills’ deal, which obviously wouldn’t work for Swarovski). However this experience shows that the Swarovski warranty is genuine and transferable. The process works smoothly, is prompt, comprehensive, and offers a high standard of service and repair and includes free return shipping. All in all, full marks for Swarovski customer service!